Few home inspectors take the time for a thorough home inspection walk-through at the end. Yet the walk-through is extremely important for the buyer, the realtor, and the home inspector. Here is why we always encourage our clients to attend the home inspection walk-through at the end. Yes, we are all busy people and it might be difficult to spare an extra 45 minutes. However, the walk-through at the end offers a several benefits that might not necessarily be apparent to everybody. Reading a home inspection report without context can be really scary, especially for first-time home buyers. At first, you think you found the perfect house and spent several hours checking it out. Then you get a 50-page inspection report with 15 pages worth of defects listed in the summary at the beginning. Worse, the report describes several of the defects as safety issues or potential health hazards. After reading all that, you just want to run screaming for the hills. Yikes! On the other hand, if you had a walk-through with the inspector, the report will look a lot less scary. A good inspector will show you all the things he found and explain to you why they are important. More importantly, he will answer all your questions and concerns that you might have. If the home inspector does a good job with the walk-through, you will walk away satisfied, well-informed, and confident about your decision. Sure, skipping the walk-through could save you 30-60 minutes. Consider this, though: If a customer sees the inspection report without the benefit of a walk-through, the report could scare the crap out of them. This means you might spend hours on damage control and explaining things to the client. On the other hand, if the client sees the report after the walk-through, it will make much more sense to them. You will spend a lot less time explaining things to the client and calming them down. In the end, it will be much easier for you to go over the report with the client and prepare the BINSR. Look at it this way: Would you rather spend an extra 45 minutes hanging out at the inspection? Or would you rather spend several hours talking the client off a ledge after they read the report? Many home inspectors will zip through the house, make their notes, and run out the door when they are done. The client receives the report afterwards by email and needs to figure things out by themselves. Worse, many inspection reports are rather cryptic, difficult to read, and/or contain many grammatical or editorial issues. Let’s face it: Writing clear and concise reports is usually not a strong suit of home inspectors. 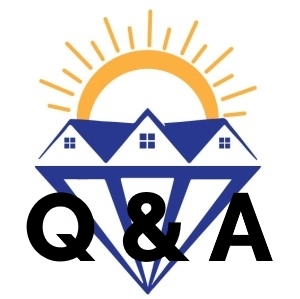 As a result, clients often call the inspector for clarification or with follow-up questions. This can be disruptive and take up additional valuable time. The solution for this is easy: Take the client on a thorough walk-through, explain your findings, and answer their questions. It will reduce the amount of follow-up questions from the client to almost zero. In addition, the client will understand much better what you did during the inspection and appreciate your work more. This is why we always encourage our clients to attend the home inspection walk-through. If you are thinking about buying a house in Tucson and need a home inspection, give us a call. Not only will we do a thorough inspection for you, we will also do a thorough walk-through with you and answer all your questions.